The perfect source for any research on the Basic Law. An excellent reference work containing the full text of the Basic Law of Hong Kong, various decisions and decrees of the National People’s Congress on the Basic Law and other founding documents, in both English and Traditional Chinese. For easy reference, the work also contains dual indexes in English and Chinese. The perfect source for any research on the basic law area which by necessity involves looking at the original text. The title also colour diagrams of the flag, emblem and official map for the Hong Kong Special Administrative Region. The contents of this title have been carefully selected by P.Y. 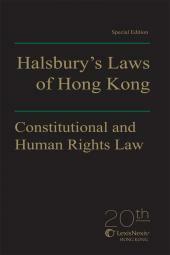 Lo, author of the highly esteemed ‘The Hong Kong Basic Law’ as an ideal companion to his iconic text.